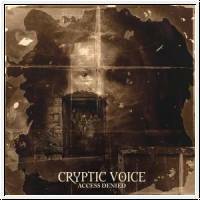 CRYPTIC VOICE - Death Metal from Switzerland. Their signature sound today blends grooving Death-Metal rhythms with aggressive vocals, unconventional double-bass attacks with melancholic melodies, and rolling beats with harmonic hooks. Each band member contributes his own unique musical background where it makes sense musically and enriches the overall song. In this way, CRYPTIC VOICE is not afraid of trying unusual things like using a megaphone to boost the aggressive tone of a song. Guitar leads with Wah-Wah-Effect also belong to CRYPTPIC VOICE’s repertoire and widen the musical spectrum. The result of these experiments is the band’s latest album, “Access Denied”, which was finished at the end of March 2007. This album contains 13 original compositions and over 54 minutes of music. Each song deals with a different subject and stands for its own.